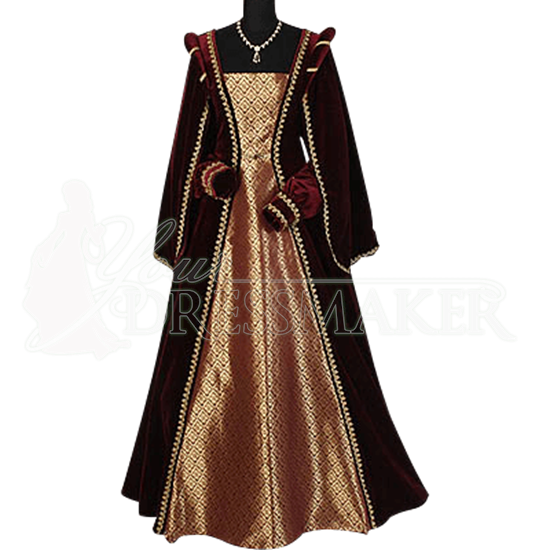 The Courtly Renaissance Dress is made from high-quality red velvet and gold baroque damask. It is a stylish and elegant garment that is fit to be worn by queens, despite the absence of any opulent decorations like jewels or metalwork. The bodice and skirt of this dress is made predominantly of soft red velvet with gold decoration. Only the front of the bodice and skirt are different, as they are intricate, gold-colored baroque damask. The shoulders of the dress feature rounded velvet decorations, while the sleeves are a dual-layered, full-length design. The actual sleeves are fitted to the arm and end in cuffs decorated with gold patterns. A sort of sleeve-covering made from velvet falls from the shoulders over the top of the sleeve, adding a billowy, flowing look to the dress. The back of the Courtly Renaissance Dress features laces which are used to fasten the dress, while simultaneously adding a level of adjustability to the dress. The dress is also pictured above with a petticoat, to give the dress shape. Please note that a petticoat is not included with the dress. When you wear the dress, if you wish it to have a similar shape, then you can purchase a petticoat or hoop-skirt separately. This dress can also be worn without either of these two accessories without problem. 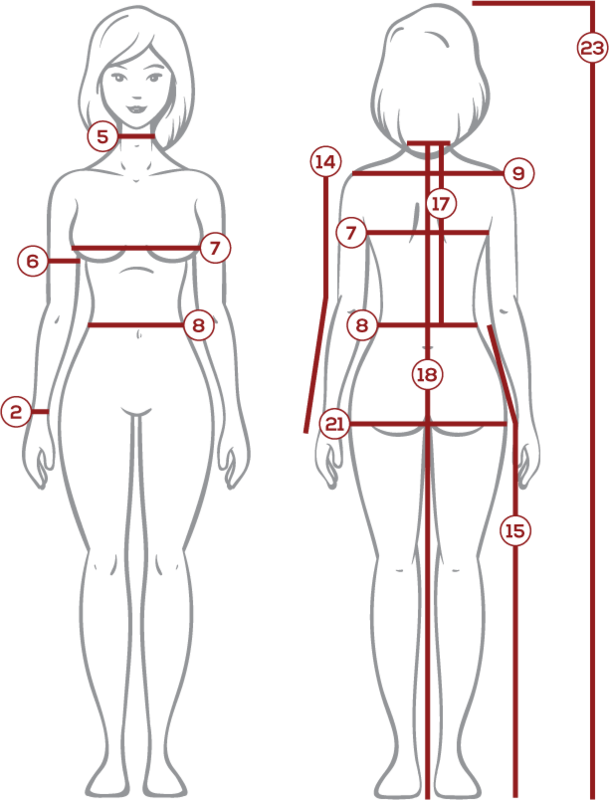 The necklace pictured above is also not included with the dress. 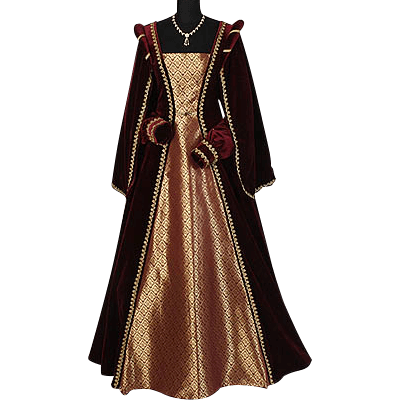 The Courtly Renaissance Dress in red and gold will have nobles, royalty, and even queens clamoring about the beauty, prestige, and elegance of this amazing dress. 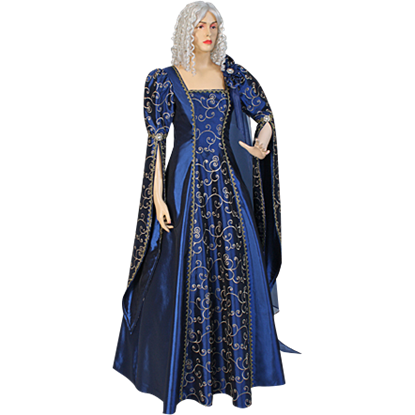 The German Renaissance Dress is an elegant and attractive renaissance-styled dress that is made from high-quality materials. 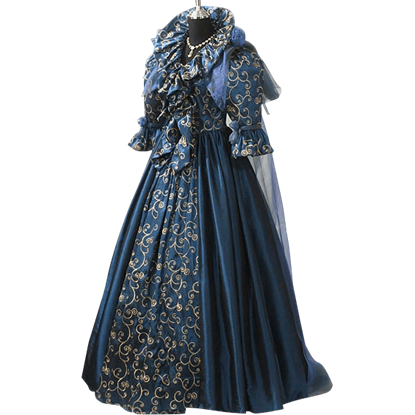 Combining regular and ornamented taffeta, this dress can transform any modern woman into a renaissance beauty.